Here we go! This is the issue of Bucky Barnes: The Winter Solider that I was looking for. Now I just need to find those pesky droids! I can now see in issue #4 what happens when the Unseen gets his job done! Bucky and Ventolin are hitting it off. It’s love Agents! Daisy is asked by someone who looks like Bucky if she loves the Winter Soldier, with an answer that will allow for future super dramatic romance storylines if Ales Kot chooses to go that way. Meanwhile, 200 years from now in another universe, Bucky Barnes sits down in his retirement home reviewing the good work of his tenure as the Unseen. He has brought 70 years of peace to the universe. This Bucky watches his multiverse TV, spying on his doppelgangers in other universes. In many, Ventolin and Buck are happy. But in Marvel 616 something horrible happens. So Bucky reaches out to a contact in the main Marvel universe to find a solution. I did not like issue #4. The whole story of Uncle Ben looking Bucky watching his cosmic television stalking other Bucky’s in his house from Up failed to get my attention. It just seemed odd. Now, Ales Kot does odd. But sometimes odd fails. Perhaps it is all above me. But it is not all M.O.D.O.K. in love! And there is an art change. Marco Rudy and his dreamlike art is replaced by Langoon Foss for the majority of the issue. Foss’ style is more cartoonlike to me. So reading these issues in rapid order really hurts the transition. Daisy for example just never looks right to me. I simply did not have time to transition mentally to the style. And Rudy’s art really does match well with the Kot writing style. So perhaps the match of writer to artist is hurting the story since Uncle Bucky is not presented in Rudy’s style. One of the big questions for me is where was the super villain revealed from last month. At times I worried that Kot forgot about him. Good news Agents, Kot does not tend to forgot much…other than where he left Mockingbird at the end of the Volume Two of Secret Avengers. Really I wonder what Secret Wars means for this title? This issue highlights the fact that the Bucky’s work in a multiverse, not a Battle World. And which version of Bucky is the one that could survive. You know thought, perhaps Secret Wars could allow Daisy Skye “Quake” Johnson to join the Marvel 616 in a MCU-like version. I just see that future event as being disruptive to what is going on with Kot’s story. And perhaps the events of Secret Wars wiping this away and perhaps letting Bucky not be a villain could be for the best. 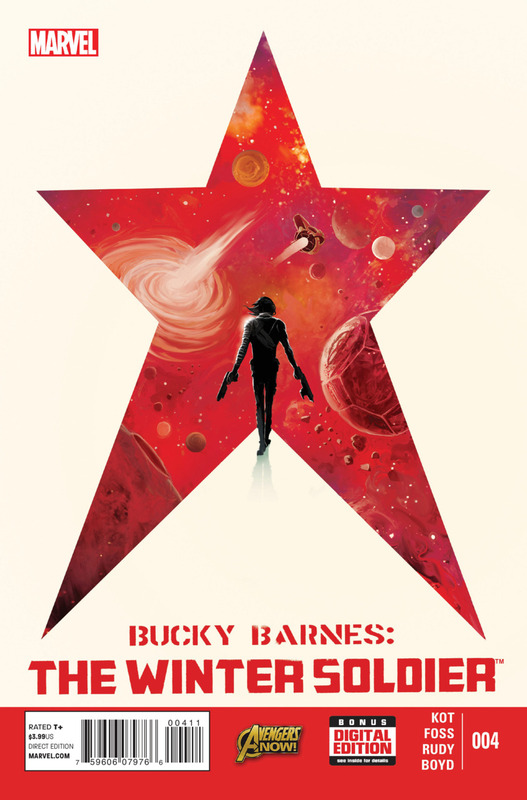 I really enjoyed the first issue of Bucky Barnes: The Winter Soldier. And I am glad that I gave it a solid chance as a monthly title. I was so excited I created a new category for Comic Files. But at this point I am planning to walk away until I can borrow a trade. If someone wants my issues, send me a message. Though I really want to keep issue #1, but I could probably be convinced if you make the right offer. Hey, is that an ad for a Darth Vader book. Guess I can redirect my Bucky money to Darth!